Sturdy box way model capable of low speed heavy duty machining. Armed with latest FANUC Oi control and standard LCD screen which generates high-resolution graphics and functions to achieve best possible operation environment. High rididity box way with scrapped slide way and precision oil networl design for superb transmission efficiency. 45-degree slant machine body structure squarely with low center of gravity for enhanced machining accuracy. High rigidiry spindle structure Module designed spindle and collet type bearings are used as support for enhanced accuracy and service life than stock type spindle structure. Powerful turret Fitted with powerful hydraulic turret for heavy duty machining. Structured with rigid mechanical parts to meet with strict requirements for high machining efficiency. Imported highly intensive pitch type belt provides solid grip without slipping. Out-fitted transmission device produces little noise and has good heat transmission for good heat radiation. Easy maintenance and adjustment. 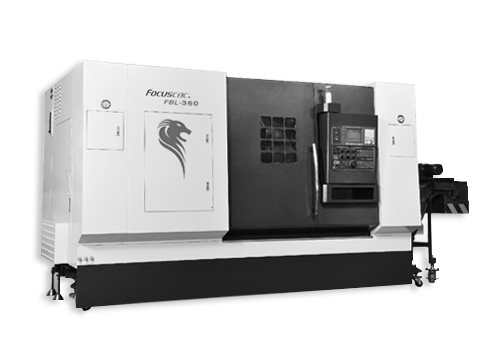 Programmable tailstock system High rigidity machine body highlights shock-dampening property. z-axis saddle driven by programs for automatic control of tailstock movement. optional rotating arbor for greater workload. Chuck size inch 12(15)" 12(15)" 12(15)"